Crinum lily is a bulbous plant belonging to the Amaryllis family and is mostly grown in the swamps and bogs. This beautiful plant is native to tropical Indo-Pacific. It falls in the group of perennial plant grown in the southern part but it is visible even in the northern areas shooting up during the warmer months and staying dormant during the winter months. It is native to China, India, south Korea, Hong Kong, Florida, Bangladesh, Sri Lanka, Maldives, Mexico etc. It is commonly found in the tropical regions of the world such as Africa and Asia. It is the lover of heat and moisture and grows well on sandy seashore or back in the mangrove. Crinum lily produces colorful and bright bloom in summer. It has many names such as southern swamp lily, spider lily and cemetery plant. This plant grows up to 3 to 5 feet height when it reaches at maturity stage. Description: Crinum lily is a large lily growing from an underground bulb. It is considered as the hallmark of the Southern gardens. It belongs to the genus Crinum with around 130 species. It is mostly cultivated in Florida. It has several species and the height of this plant depends upon the kind of species, some crinum lilies are of 13inches while others are of 6 feet tall. It is wonderfully scented but the plant is poisonous in nature. · Crinum lily produces wonderful fragrance. · It is most colorful during the summer months. · It grows fully well in full sunlight. · It does not grow in waterlogged soil. · It is planted with the pointed part of its bulb facing upwards. · The crinum lily is active during the summer months and goes dormant in winter if the outside temperature is unbearable. · They are adaptive to irrigation and fertilizers. · It has definite growth period, rest period and bloom period. Foliage: The foliage of crinum lily is course, spirally arranged and is open. It is up to 2m long, fleshy and is strap-like in appearance. Flower: Crinum lily produces large,unique, funnel shaped, clustered, showy blooms in late summer with beautiful, elegant and attractive pink stripped blooms. The color crinum lily varies according to their species. It is found in pink, white, deep rose and even striped. It has amazing fragrance. In areas where the climate is warmer, crinum lily stays in bloom almost throughout the year. Fruits: Crinum lily has a globed shaped fruit that turns shin white in color when fully bloomed. It has irregularly shaped seeds. 1. Plant the large bulb with the pointed part facing upwards, on the surface of the soil and in the sun during the early spring months. 2. It grows well in well drained soil. Thus, it is important to find an area where the soil drains well. Let the soil be rich in compost manure, peat moss, ground bark or decomposed manure. 3. Make sure the soil is not waterlogged. As this plant is the lover of moisture, it is suggested to provide water to this plant during plantation but not excess amount of water. Keep mount of soil on the outer edge of the plant in order to direct the flow of water, soil must drain water for the root should not sit in water for a long time or it may get rotten. 4. Let the plant get excess sunlight and very less shade. 5. After the full bloom, do not cut off the foliage but let it conserve heat from the sun, water as necessary, let it get prepared for the next season of bloom. Plantation suggestions: It is best suggested to plant crinum lily in the right season for an abundant bloom. One can trim or remove the unkempt leaves and blooms, course draping foliage and have tidier appearance. It is best suggested to plant crinum lily with a distance of 4 to 5 feet apart. This plant grows well in freshwater or in brackish swamps. Fertilize three times a year – summer, spring and autumn. Care: It is easy to take care of crinum but sometimes they get attacked by enemies such as grasshoppers, red blotch fungus, (red spots on leaves), crinum mosaic potyvirus (cause yellow streaks on leaves) spider and mites. Watch out for spiders, grasshoppers and mites before they eat up this beautiful plant. 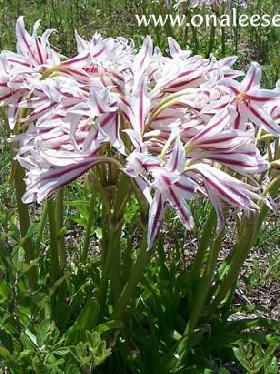 Uses: Crinum lily has numerous uses that can be enjoyed by the plant lovers. · The suitable height of this plant serves as the hedge for gardens or a nice, presentable home boundary. It brightens the late summer gardens. · Its colorful bloom and fragrance can be enjoyed. · Having crinum lily at home adds extra color to beautify ones home. · They serve as bedding or border plants. For the treatment of injury and inflamed joints. For carbuncles and cancer treatment. Oiled leaves and wounds for the treatment of poisoned arrows, bites and stings, swollen joints, swellings, lumbago and also to ease headache or fever. The leaves make a tropical treatment for inflammation. Leaves are used as rheumatic remedy in Malaysia. vIn Trobriand, Papua New Guinea, the stem fibers are used to stop bleeding. vThe juice from the bulb is ingested for two months for the treatment of gonorrhea. vThe crushed bulbs are used as an ointment for the treatment of wounds in the Philippines. · Bulbs: Bulbous plantation of crinum lily is common in the landscape and nurseries. · Seeds or offsets pups: gardeners can plant this flower through large seeds or offsets called pups during the active growing season of this plant. · Although considered poisonous, traditionally this plant is used as a poultice for aches, sores and chaps. · The crushed leaves when mixed with honey can be used in the treatment of wounds and abscesses.